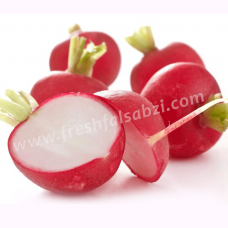 Red Radish is the root vegetable in the brassica . The crunch, biting taste of red radish ranges from the juicy crispness of red globe radishes to the spicy of turnip-shaped black radishes. Benefits : Radishes help in water retention and digestion. It can be effective in treating bee stings and insect bites. These are effective at lowering the body temperature as well as relieving inflammation due to fevers.